Neuro Linguistic Programming Training Material is designed for trainers to develop workforce knowledge and understanding of NLP. Confidently train staff and managers how to define neuro linguistic programming, how to make sense of our senses, the power of hypnotic language and more! 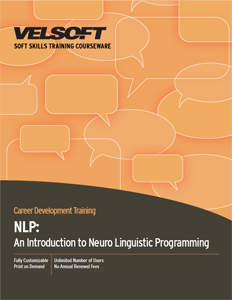 Seeing is Believing This sample manual to teach Introduction to Neuro Linguistic Programming is in MS Word format. Even if they aren’t aware of it, a person’s thoughts and behavior are at the core of what they do every day. Neuro linguistic programming training (NLP training for short) involves bringing those unconscious thoughts to the surface, heightening a person’s self-awareness. By learning how to be aware of how they structure their thinking, a person can learn how to make real choices to determine strategies that lead to success. NLP techniques can be applied to all areas of life, from interpersonal communication, building relationships to nail a sale, to business and management techniques! Velsoft’s one-day course provides an introduction to neuro linguistic programming. Like all of Velsoft’s training material, it’s completely customizable for instructors who want to provide students with the basics of NLP business training. Students are provided the opportunity to create a personal action plan to help them implement their NLP strategy outside of the classroom. Velsoft’s training material includes a quick reference guide, instructor’s guide, NLP tutorials and exercises, and access to Velsoft’s novel eLearning website so trainers can create a fully-integrated blended learning environment that allows students to cover the material independently.